They may not be unified in their style of performances or locations within the venue, but Ohio State’s choirs are hoping to harmonize each other in a concert Friday night. 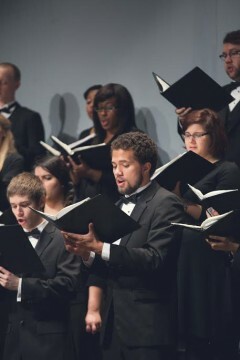 Choral Collage is scheduled for Friday at 8 p.m in Weigel Auditorium. Admission is free and the event is open to the public. Casey Cook, a collaborative pianist, also expressed her enthusiasm for the upcoming concert. The Women’s Glee Club, Men’s Glee Club, Symphonic Choir, University Chorus, Women’s Chamber Ensemble and University Chorale are all set to perform at the event, MacMullen said. Choral Collage is part of a two-day event, said Tamara Morris, spokeswoman for the School of Music. This is the first time Choral Collage is to be coupled with the Vocal Arts Showcase. On Saturday, selected high school students will make their way to OSU to observe a mock voice lesson from two current undergraduate students as well as be a part of an honor choir with guest clinician Ryan Beeken. Friday’s concert is slated to consist of works from Mozart, traditional Appalachian folk songs, songs in different languages, and both accompanied and a cappella pieces, Cook said. “It’s a choral music lover’s buffet,” she said. Made up of roughly 300 individuals as a collective whole, MacMullen said, the ensembles will make their way around Weigel Auditorium. They’ll be found on the stage, in the aisles and orchestra pit, and other unexpected locations, Maietta said. “You never know which direction sound will come from,” she said. Alissa Bodner, a fourth-year in piano and choral music education, is slated to perform Friday night. Despite the many hours of work that have gone into preparation for the concert, MacMullen explained the biggest challenge they’ve encountered so far is coordinating all 300 people. Before the concert, they have one shot at putting everything together before show time, she said. “It’s a stressful hour. The ensembles are bouncing around and have to be thoroughly independent,” she said. Maietta said she has faith the hard work will pay off in the end. “Overall, I think it’ll be a really iconic experience,” Maietta said. Choral Collage is part of a two-day event, said Tamara Morris, spokeswoman for the School of Music. This is the first time Choral Collage is to be coupled with the Vocal Arts Showcase. On Saturday, selected high school students will make their way to OSU to observe a mock voice lesson from two current undergraduate students as well as be a part of an honor choir with guest clinician Ryan Beeken.